I had never read a book by Jaimie Admans until North Pole Reform School, which I was drawn to because I was looking for some good Christmas reads which weren’t the traditional (and if you’ve checked out the plot, you’ve probably noticed that it’s a slightly wacky story unlike no other). I’m still not 100% sure what I read; I mean, North Pole, zombies, someone with a phobia of ducks… It was madness, yet such a fun and sweet Christmassy read! I loved the story. At times it was hilarious and others just cute or a little more serious but it was never not entertaining. The author seems to have a ridiculously creative style. From reading the first quarter or so of the book, I was finding it really funny but wasn’t actually sure if I was going to be too taken by the characters. However, as the book went on, I really liked Luke and Misty. I loved seeing how their relationship progressed rather than having them meet and fall in love instantly. Their joking and banter just made me smile throughout. As much as this was a bizarre story, it’s still a great Christmas read. I mean there’s a whole host of Christmassy characters like Santa and elves and reindeer and the whole story got me in the Christmas spirit. The ending I loved. I can’t even talk about it but it just summed up the crazy invention of Jaimie Admans! Overall, it was the author’s imagination that had me laughing and crying at North Pole Reform School. It had a little bit of everything you’d expect in a Christmas book plus a whole lot of the unexpected too and this was just a fun read which I’d totally recommend. 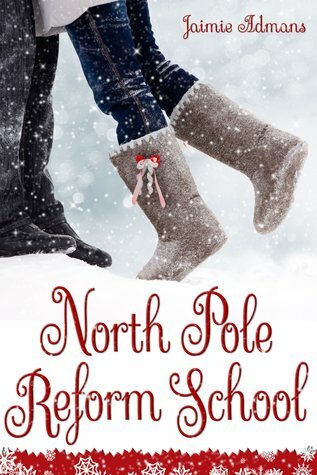 Sign into Goodreads to see if any of your friends have read North Pole Reform School.